If you were to ask me what has been the biggest game changer in my journey through motherhood I would answer in a heartbeat without any hesitation: babywearing. Actually it would probably be more like BABYWEARING! because I am so psyched about the ability to keep my little one close while still being able to get stuff done. This post is dedicated to all of the reasons you should try babywearing and some safety tips for starting out. This is neither a scholarly article nor a research paper so my sources are pretty broad and, if you are interested, you can email me for more information. The majority of this evidence can be found on the Babywearing International website and I would encourage you to check it out if you have any questions or concerns that I don’t cover. Also I think it is important to point out that this is not a conclusive study on babywearing safety and you are responsible for the safety of your child as well as that of yourself. It is very important to learn how to use the type of carrier that you choose properly and to always keep safety in mind. Babywearing is, by definition, the practice of wearing your little one in a sling or carrier (thanks for that Wikipedia). 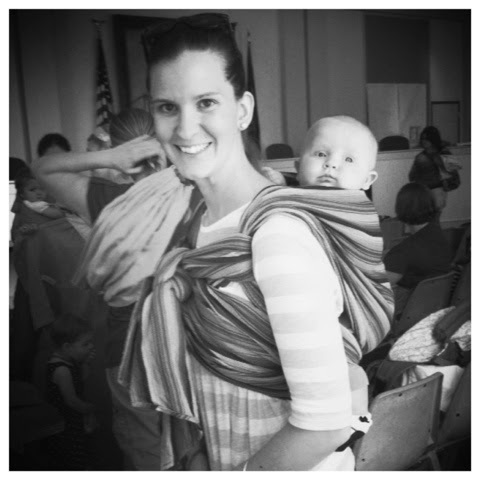 In all truth, babywearing is about so much more than just putting your baby in a carrier. Babywearing is also about convenience, bonding, and improving the overall health and happiness of your child (and you too!). Putting your little one in a baby carrier can be immensely freeing. It gives you the opportunity to take care of older children, do chores, run errands, or a number of other tasks without lugging around a bulky car seat or taking frequent breaks to help a distraught baby. Baby carriers can go places that strollers can’t go and some of feelings of isolation and confinement can be overcome by simply taking a walk and meeting other parent friends. Sometimes having the freedom to get out of the house without having to navigate a stroller through the aisles of store can make a new mom or dad feel like they can “do” this whole parenting thing. Babywearing is a great way to bond with a new baby. By holding the baby close, dads, grandparents, and other adults in the baby’s life are able to form strong attachments. This bonding can be extremely useful for babies that are breastfed because it helps them to trust important people in their lives beside their mothers, giving mom a break from being the sole provider for a new baby. New moms can be incredibly overwhelmed with having another person literally attached to them at all hours and having another adult, such as the dad or a grandparent, hold the baby for a time can be extremely beneficial. But don’t be fooled, the benefits of babywearing are for all parents and babies, no matter what choices you make in your parenting journey! For babies born early or those with special needs, babywearing can be beneficial health-wise. Research has shown that premature babies who are touched or held gain weight faster and are overall healthier than those babies who are not. Babies who are held close and ideally skin-to-skin experience a regulation in breathing and heart rate as they sync up to the adult who is holding them. Just check out some of the great information from one of my favorite products for preemies, the NuRoo (http://nuroobaby.com/skin-to-skin/). 1. Make sure your baby can breathe. Baby carriers allow parents to be hands-free to do other things … but you must always remain active in caring for your child. No baby carrier can ensure that your baby always has an open airway; that’s your job. a. Never allow a baby to be carried, held, or placed in such a way that his chin is curled against his chest. This rule applies to babies being held in arms, in baby carriers, in infant car seats, or in any other kind of seat or situation. This position can restrict the baby’s ability to breathe. Newborns lack the muscle control to open their airways. They need good back support in carriers so that they don’t slump into the chin-to-chest position. b. Never allow a baby’s head and face to be covered with fabric. Covering a baby’s head and face can cause her to “rebreathe” the same air, which is a dangerous situation. Also, covering her head and face keeps you from being able to check on her. Always make sure your baby has plenty of airflow. Check on her frequently. 2. Never jog, run, jump on a trampoline, or do any other activity that subjects your baby to similar shaking or bouncing motion. “This motion can do damage to the baby’s neck, spine and/or brain,” explains the American Chiropractic Association. 3. Never use a baby carrier when riding in a car. Soft baby carriers provide none of the protection that car seats provide. 4. Use only carriers that are appropriate for your baby’s age and weight. For example, frame backpacks can be useful for hiking with older babies and toddlers but aren’t appropriate for babies who can’t sit unassisted for extended periods. Front packs usually have a weight range of 8 to 20 pounds; smaller babies may slip out of the carrier, and larger babies will almost certainly cause back discomfort for the person using the carrier. A carrier should never place your baby in a position that you wouldn't carry them naturally. Babies would be carried in arms upright on the chest, upright on your hip, cradled while nursing, or even in a piggy back. You would never carry your baby horizontally at your hips, or smushed under your breasts, therefore you should avoid any carrier which forces you to place your baby in this position. Babywearing has literally changed my life. I don’t feel burdened by schedules because both of my babies have slept really well in the carriers and I have even been mastering the art of nursing in a ring sling (and lets be serious, that’s a real art). Having the ability to go places without planning around sleep and eating schedules has changed the way I parent and it has led me to a zen-like place of minimal stress parenting. Maybe that’s overdoing it a bit but in all honesty, I feel like I am a more “laid-back” parent as a result of the convenience of babywearing - I feel like I can do this whole parenting thing!